During December 2004, an excavation was conducted at the Baha’i Gardens, c. 1 km north of ‘Akko (Permit No. A-4322*; map ref. NIG 20889/76117; OIG 15889/26117), aiming to clear part of the aqueduct and excavating the rest of it prior to its restoration. The excavation, on behalf of the Antiquities Authority and financed by Baha’i World Centre Northern Gardens Department, was directed by L. Porat, with the assistance of Y. Ya‘aqoby (administration), A. Hajian (surveying), A. Shapiro (GPS), as well as workers and volunteers of the Baha’i World Centre. The aqueduct at the Baha’i Gardens is part of the Ottoman aqueduct that carried water to ‘Akko (Fig. 1). It is one of three aqueducts to ‘Akko (R. Frankel, N. Getzov and D. Friedman [Syon], The Aqueducts of Acre and the Western Galilee. In D. Amit, Y. Hirschfeld and J. Patrich, eds. 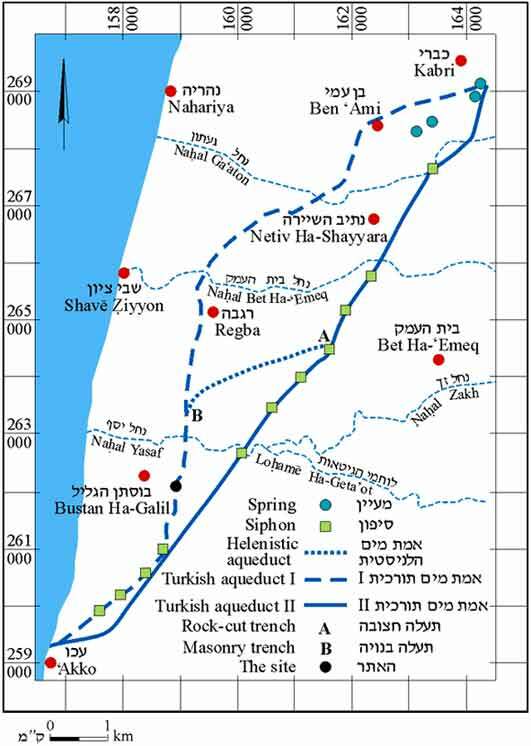 The Aqueducts of Ancient Palestine. Jerusalem, 1989 (Hebrew), Pp. 81–96). The aqueduct, which was built by Suleyman Pasha in 1815 and was in use until 1948, took its water from four springs at Kabri (‘En Shayyara, ‘En Zuf, ‘En Giah, ‘En Shefa‘). It crossed three streams: Nahal Ga‘aton, Nahal Bet-Ha‘emeq and Nahal Yasaf. Sections of the aqueduct can be seen today east of the ‘Akko–Nahariyya road, near Qibbuz Lohamē Ha-Geta’ot. Part of the same aqueduct had previously been excavated by E. Stern in northern ‘Akko, between two siphon towers. Here the aqueduct was 1 m high and the channel was replaced by three pipelines (ESI 9:104). The aqueduct (Fig. 2) was constructed above a raised kurkar mound, on the kurkar ridge. The walls of the channel (exterior height c. 1 m, width 0.65–0.80 m) were built of irregular kurkar blocks and small fieldstones bound with mortar. 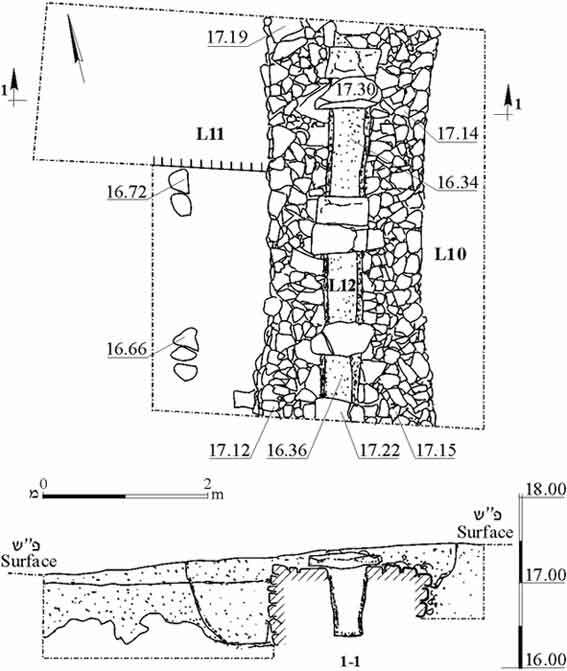 The channel itself (L12; upper width 0.5 m, lower width 0.25 m; depth 0.8 m) was coated with plaster and partly covered with kurkar and limestone slabs (length 0.6–0.7 m; Fig. 3). The exterior side of the aqueduct was built unevenly and covered with sand (L10, L11). 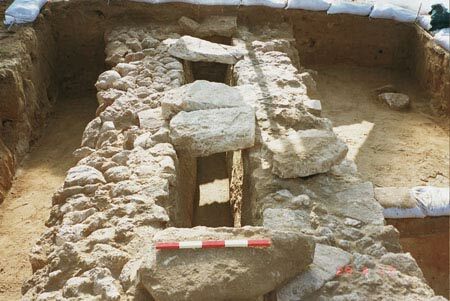 The excavation did not produce any evidence for an earlier aqueduct and did not yield any pottery or other finds. Two further sections of the aqueduct were cleared c. 30 m north of the excavation area, each 10 m long. The walls of these sections were constructed in a V-shape and the plaster covered partly their top. 1. The aqueduct to ‘Akko from the Kabri springs and the excavation area. 3. The aqueduct after excavation, looking south.